Professor Marston & The Wonder Women (film, 2017). A 2017 American biographical drama film with "R" rating by Annapurna Pictures/Sony Pictures Worldwide Acquisitions. Directed by Angela Robinson. Official Trailer. Professor Marston & The Wonder Women is a 2017 American biographical drama film directed by Angela Robinson. 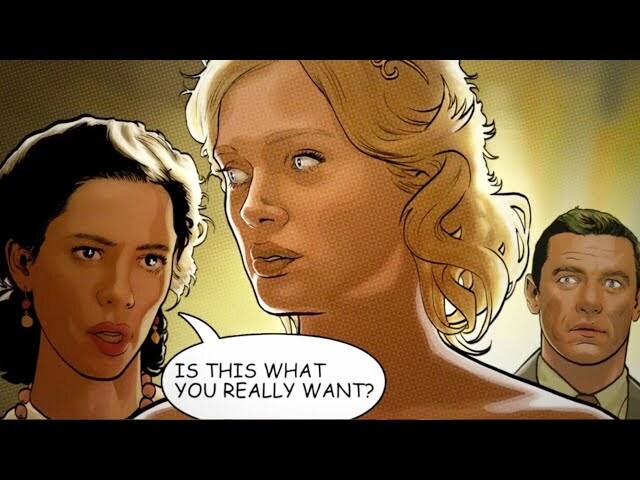 PROFESSOR MARSTON & THE WONDER WOMEN | Comic Trailer. The story is told in flashbacks set during a 1945 testimony that William Moulton Marston gives to representatives of the Child Study Association of America. In the year 1928, William and his wife Elizabeth teach and work on their research at the associated Harvard and Radcliffe Colleges. One day, William hires one of his students, Olive Byrne (daughter of Ethel Byrne and niece of Margaret Sanger - two famous suffragists and feminists of the 20th century) as a research assistant. Olive aids in the Marstons' work in inventing the lie detector and conducting research on William's DISC theory on human interactions, and the three soon grow close. One after another tests by the lie detector reveal that they have fallen in love with one another, and all three of them begin to engage in a polyamorous relationship. As words about their unconventional relationship gets out, the Marstons are fired from the university. Olive reveals that she is pregnant and moves in with the Marstons shortly after. The trio decide to build a family together and create a fabrication to keep secret the nature of their relationship. The family settle in a New York suburb, happily together. By 1934, both Elizabeth and Olive bear children by William (Olive has two sons and Elizabeth has one son and a daughter), telling the neighbors that Olive is a widow and taken in by the Marstons. William starts trying to make a living as an author. Elizabeth takes a job as a secretary and becomes the main breadwinner of the family. Olive stays at home and takes care of the kids, occasionally submitting her writing samples to publishers. They raise their four children together, and Elizabeth names her daughter after Olive. Principal photography began in early October 2016. The film Professor Marston & The Wonder Women was scheduled to be released by Annapurna Pictures and Sony Pictures Worldwide Acquisitions on September 9, 2017 (TIFF), on October 13, 2017 (U.S.) and on November 2, 2017 (Germany). The duration of the film is 108 minutes. The film grossed over $1.9 million. Professor Marston & The Wonder Women got high rating from critics. The audience also likes the film.